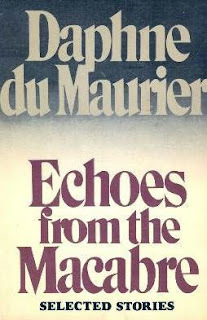 I'm back to reading the short stories of Daphne DuMaurier in Echoes of the Macabre this week. I'm going to finish this one shortly. I just finished The Old Man and it might be the cleverest short story I've ever read. The narrator is the neighbour of a strange couple, one he calls the Old Man. The Old Man is a gruff customer and the narrator keeps his distance. He watches him and his family from afar until he witnesses the Old Man commit a terrible crime upon one of the children. While I was reading this I kept thinking what a weird family and why didn't the narrator tell someone, that is until the last paragraph which is brilliant. It was literary slight of hand. I had to go back and read it all again with this new information in mind. It was a completely different story. You need to read The Old Man. In The Blue Lenses, a woman undergoes an operation to repair her sight. When she is finally able to see again, people around her are revealed as they truly are. It would be comical if it didn't cause the woman so much fear and anxiety. As always, there is the surprise twist at the end. The Blue Lenses is not only an entertaining story but has a deeper message, especially for wives of husbands with wandering eyes. I completely agree about The Old Man! The last paragraph made me want to read the whole thing all over again. It was so well done! I haven't heard of this... Makes me really want to read it though! I had no idea that du Maurier had written so much! I'm about a third of the way through Rebecca and really enjoying it-I look forward to discovering her other works in the future and will keep this anthology in mind! I loved Rebecca, and now you've convinced me to hunt down Du Maurie's stories... especially The Old Man! Why do I keep thinking that I've read something by DuMaurier, but can't place what it was. In any case, you've definitely sold me on that one. That last paragraph of The Old Man! I get goosebumps even now and I have read it at least half a dozen times. She was a master of the short story - I have also read Rebecca about three times! But The 0ld Man is amazing - chills all over. Another short story writer, not really known for his short stories (in may life anyway) has to be Tennessee Williams (sp? ).